No matter how great your idea is, the difference between your business proposal and someone else’s could boil down to the look and feel. A title page, header and footer, table of contents, and other elements separate a professional-looking document from a dull sea of text. It’s worth your time to learn how Word’s tools and wizards make such formatting easy—and keep exploring other ways to present your work in the best possible light. Any type of professional-looking document should have headers and footers. Headers and footers are where the title of your document, the page number, and any footnotes and citations you’ve referenced in the body of your paper will reside. 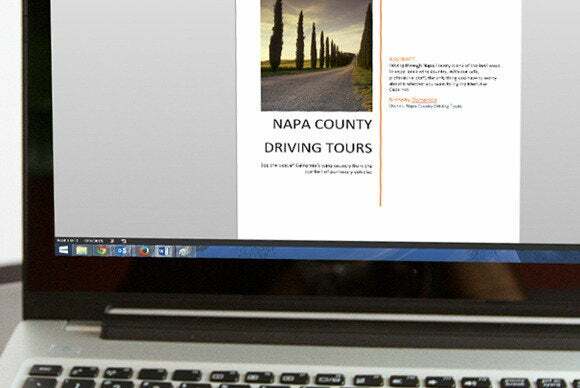 Based on the type of document you’re creating, you’ll want a header, footer, or both to house relevant information for the reader to reference. 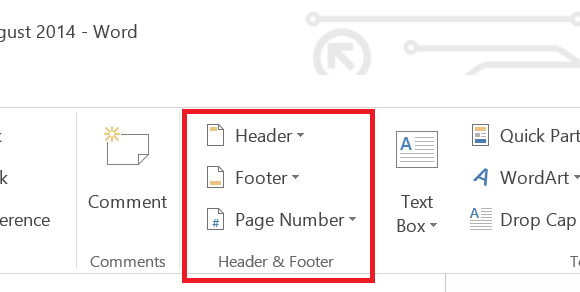 To insert a header and footer, use the Header & Footer menu in the Insert ribbon. To get to the Header and Footer submenu, click Insert. Depending on which you want to insert, click on either the Header or Footer drop-down menu, and select a format for the section. 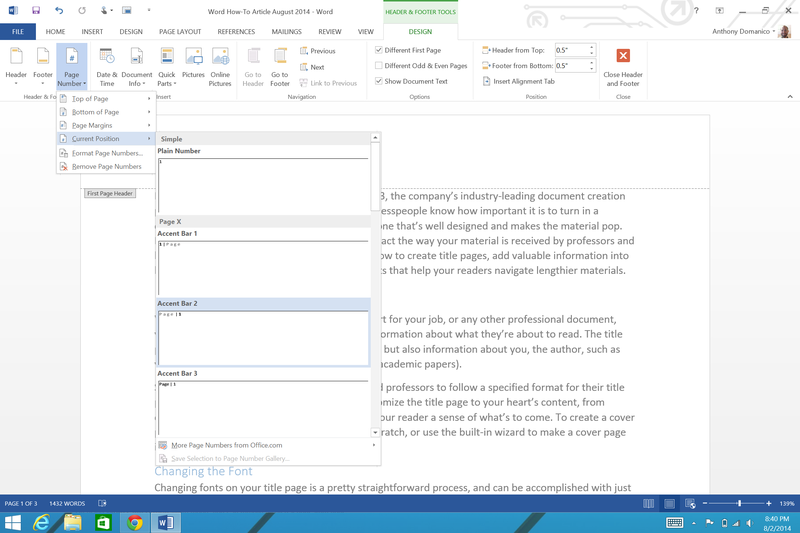 Word has several types of header and footer formats available, plus you can find user-submitted formats on Office.com. If you’re creating both a header and a footer, you’ll want to pick the same format to ensure you end up with a consistent-looking document. The header and footer Design ribbon has all the tools you’ll need to add content to those sections. 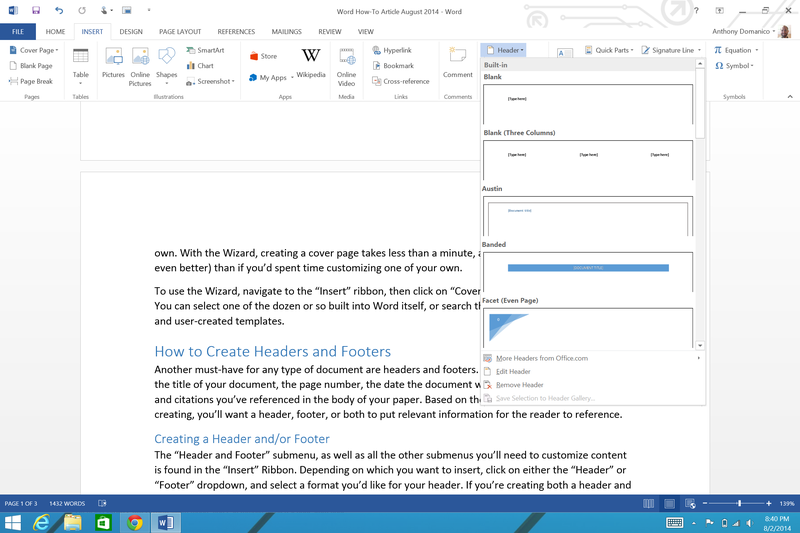 Everything you need to build your header and footer will appear in the Design tab. The first thing everyone should add is a page number. 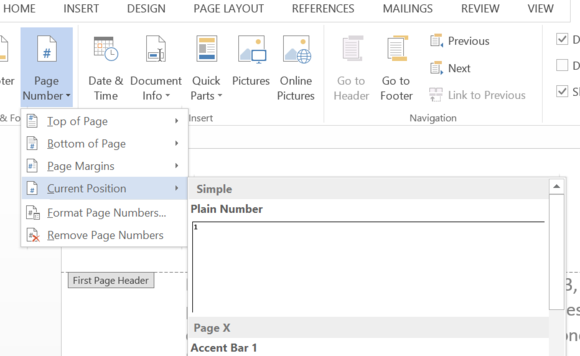 In the ‘Header & Footer’ section of the Insert ribbon, click the Page Number drop-down menu and select the formatting. 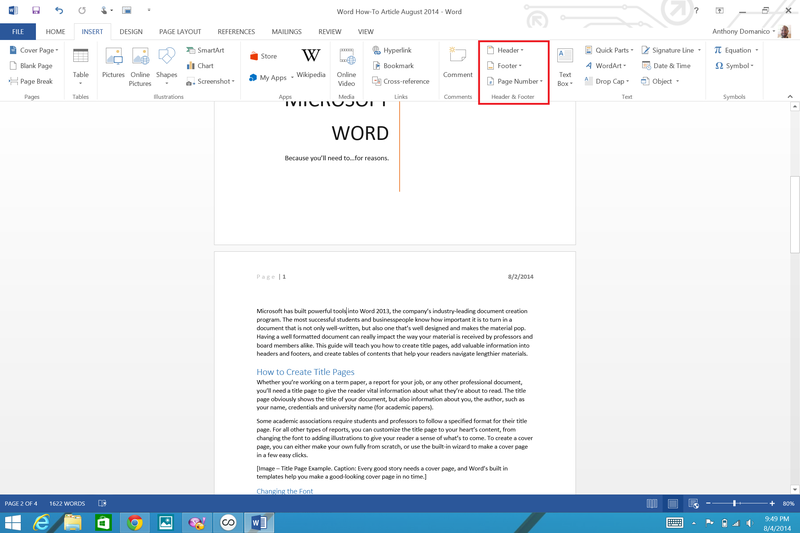 In addition to the options built into Word, you can find user-submitted choices on Office.com. One of the most important things to do on all documents is inserting page numbers. Fortunately, it’s easy to do. To give your page numbers the book effect (page numbers show up on the lefthand or righthand sides of pages alternately), check Different Odd & Even Pages. 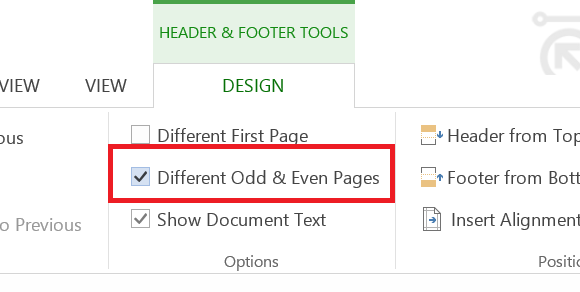 Now, you can change content in your headers and footers on odd and even pages independently. 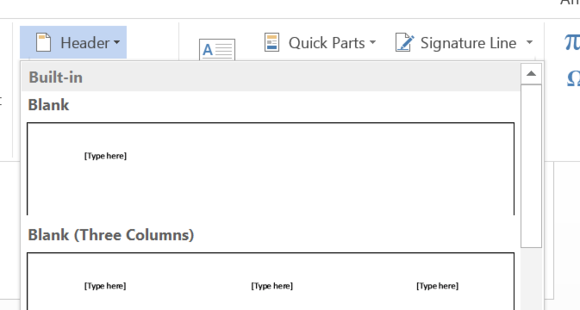 From there, use the Insert Page Numbers tool and text justification settings on the “Home Ribbon” to have them appear on the left and right hand side of your document. To achieve the book effect for page numbers in your header, you’ll need to change the settings so you have different odd and even page numbers. 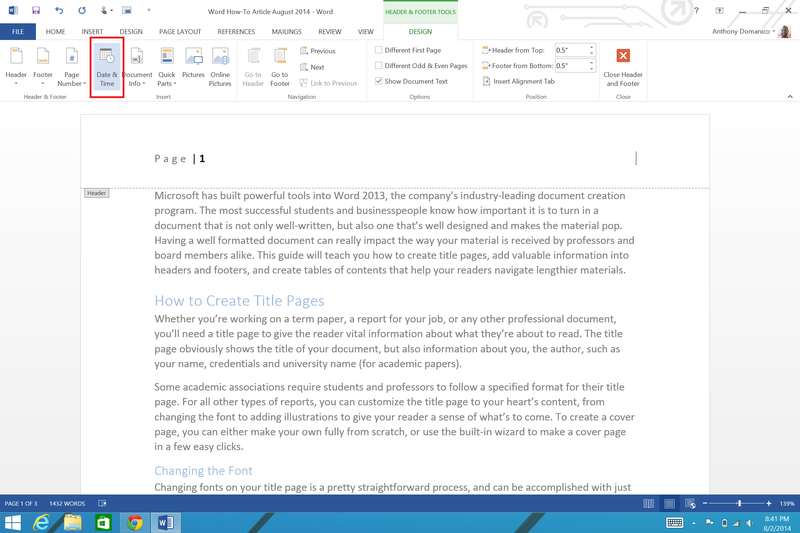 Insert page numbers and use justification settings to position the text. You can also insert the date and time the document was created using the Date & Time wizard on the Text submenu, choosing from a wide variety of formats. Use the left, center, and right justification options in the Home ribbon to align your content within the header and footer. 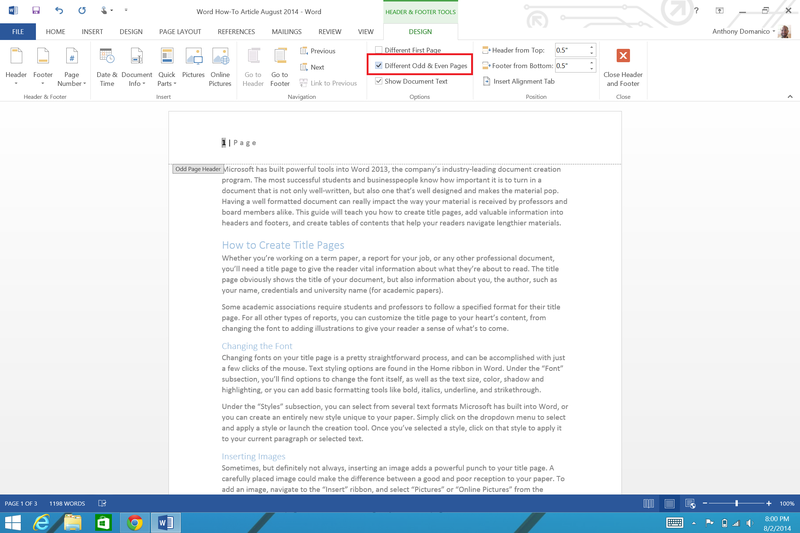 You can insert the date and time into your header or footer with just two clicks. 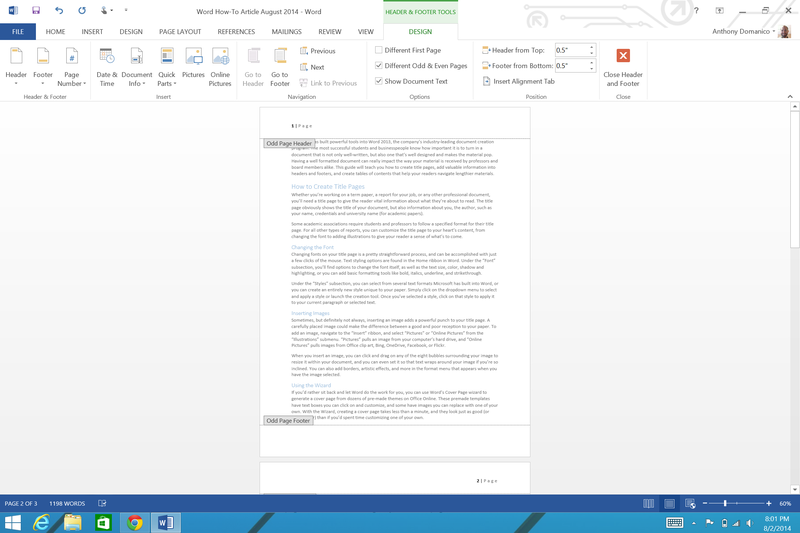 Microsoft made it pretty easy to create a table of contents that is both functional and attractive. Best of all, some of the options will update your table of contents automatically, so you don’t need to update titles or page numbers every time you make a change. A table of contents is essential for longer documents to help your reader keep track of where they are. Creating one is as easy as a few mouse clicks. To take best advantage of the automatic tables of contents, make sure your in-document headers are formatted appropriately. Select the header text you’d like to format, and click Home. In the Styles submenu, you’ll see options for Heading 1, Heading 2, and Heading 3. Just mouse over any of these header options to preview that style on your text, and click to apply. 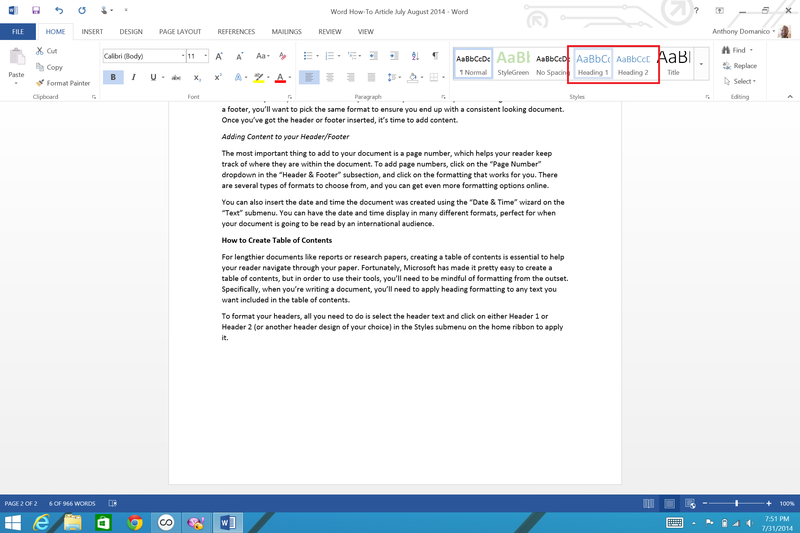 It’s very important to use Microsoft’s built-in heading font styles if you want to use an automatic table of contents. Make sure your headings are used hierarchically. Heading 1 should be a major section, while Heading 2 should be a subsection, for example. 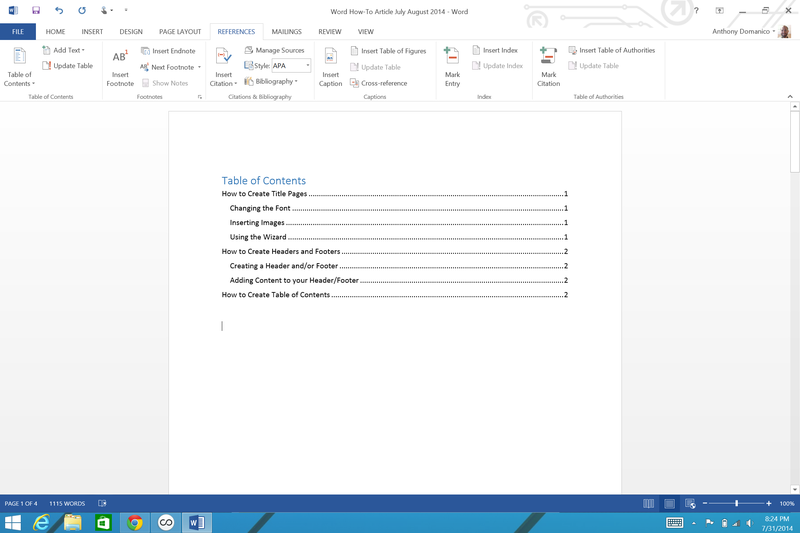 Next, I'll show you how to insert your table of contents into your document.